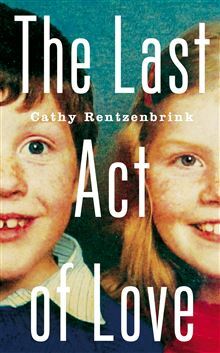 Cathy Rentzenbrink is well know among those of us who share an urgent passion for books and reading. She is Books Editor at The Bookseller and Director of Quickreads. The Last Act of Love is her first book; a deeply moving memoir about the life and death of her brother Matty. When Cathy's brother is knocked down by a car on his way home from a night out, the family are keen to stay hopeful and positive about his recovery. Matty was a strong, funny, charming young man with a bright future ahead of him; he had everything to live for. Unfortunately, this cruel set of circumstances left him permanently brain damaged with little hope for recovery. Cathy's memoir explores the aftermath of the accident, its far reaching effect on her own life, and the difficult decision her family made to allow Matty to die after nearly a decade. From the outset, Cathy conveys her adoration of her brother (one year younger than her). In the early days in hospital, she tirelessly recounts anecdotes from their childhood which vividly build a picture of their shared experience as siblings, desperate to connect with the brother she loved. As someone with a beloved younger brother of my own, I found this book incredibly difficult to read. It is a nightmare being played out. Yet, despite it being an account of tragic events, it is an incredibly warm story about the strength of a family under the most difficult circumstances. As Cathy falls into a pit of increasing depression while at University, there is a tender moment in which her mother arranges for her to go away for a few days, before she begins to see a therapist. Similarly, Cathy and her Father, seeing her mother on the brink of collapse, broach the subject of having Matty moved to a care home to ease the burden. Throughout it all, they still manage to take care of one another. There is hope also in Cathy's own journey to some manner of acceptance. For years she is plagued by conflicting guilt, and stuck in life, even after Matty's death. As she decides to write the story and begins to research other families who have been through similar experiences, there is a startling realisation that there is no right way to handle things, there is no end point to the grief. Her ability, finally, to accept her guilt and pain, to carry it with her but not to let it rule her, is a powerful moment. The Last Act of Love is a book about compassion, about what constitutes living, and most importantly, about love.